Risk currencies such as commodity Dollars have been in demand lately apart from the last few days of last week as the sentiment turned sour in markets. The Aussie and the Kiwi have been climbing higher in recent weeks, but the CAD has been lagging behind despite the bullish bias in Crude Oil. So, if someone is trying to short commodity Dollars, shorting the Canadian Dollar is the safest bet, especially if crude Oil prices start to turn bearish. That doesn’t seem likely right now as they have been trending higher this week, but at the same time, the CAD hasn’t taken advantage of the bullish Oil prices. In the last two days of last week USD/CAD rallied nearly 200 pips which is another sign that the markets want to be bearish on the CAD, which means bullish on USD/CAD. We saw a retrace lower yesterday as the USD went through another phase of selloff but the retrace is complete now. 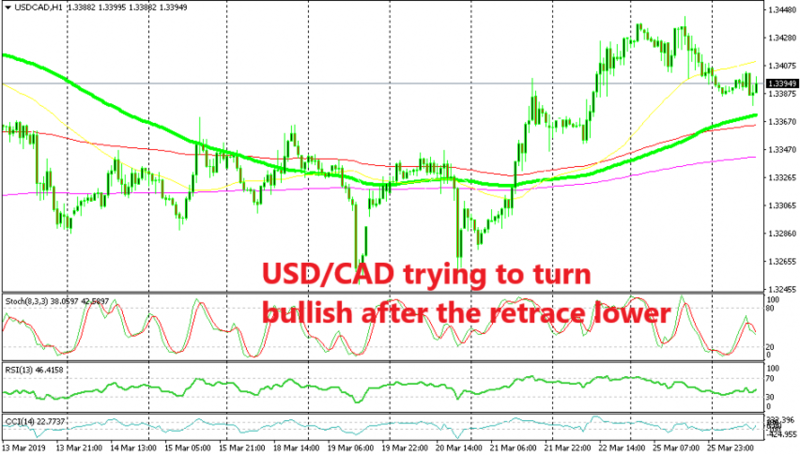 USD/CAD is oversold on the H4 chart as the stochastic indicator indicates if you want to have a look at that time-frame on your platform. Besides, the price formed a doji candlestick on the H1 chart, followed by a bullish candlestick which is a reversing pattern after the pullback lower. That chart setup formed above the 100 SMA which has provided support and resistance before, that’s why we decided to go long on USD/CAD a while ago.